Tv bracket reduced to £10 was £20. 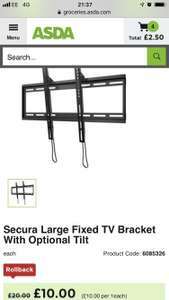 For TVs 40” to 70” - best price I’ve managed to find for a good quality mount with optional tilt. Scanning at £10 in store also. What is a shield anchor bolts? The mount I've just retired after 5 years was under a tenner from Amazon, delivered. There's a lot of cheap ones about now that work well. I've just ordered 3 different ones under a tenner each, 1 I've used previously, for various TVs for a 40 and 55 inch and an aging, very weighty, 32 inch. Best thing I can recommend is using some decent shield anchor bolts. I trust them more than the ones any mount supplies. 4 - 6 of them and nothing is moving. Mount you Samsung TV and Soundbar together. Collection only I believe. Yes it is. This is a picture of it on the wall. Not something you hear everyday... Von Haus and really good quality. I never said anything about their products or the quality of the same did I? If you are buying their product through a third party like Amazon or whoever then you'll be fine. But BE WARNED buying direct, these guys are proper cowboys. Again, believe the reviews you read on trustpilot. I’m a engineer and having seen it and the grade of the metal I trust it if properly installed but use your own level! 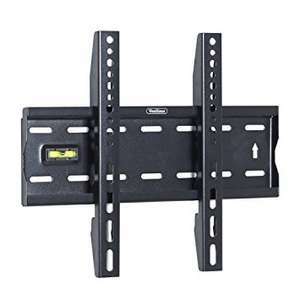 My 46in TV has been up on the wall for 4 years now with the slightly bigger version of this, and I've just upgraded to a 60in and can use the same bracket. They are sound, well-made products. It's reliability comes from how well you install it. A more "interesting decision" would be looking at this and a £50 bracket and believing that because you're paying more you're going to get a better product; now that requires therapy. I mate do you know how to access iptv app on my b8 oled. I’ve got the same tv as you but can’t figure it out. Well then you're probably one of the people who has to baby their TV lol. A quick Google shows the issues people have with OLED burn in, with countless topics and guides on how to avoid burn in. I for one do not want to be sat here worried about my TV screwing itself up all the time, and then having the manufacturer tell me to do one when I complain. Its just not worth the hassle. Is it a better image with better blacks? Yes it is - but the risk and headache isnt worth it. Anyways, I am glad you're enjoying yours without issue, thats all that matters at the end of the day. The first has been fine for 5 years now my friend! Just got my 3rd will keep you posted!! Chin chin! Yeah say that to yourself when your OLED has screenburn. Best of luck. Noob. Does this work on curved TVs and soundbars? I will try again in 2028. Some of the best brackets i have ever bought in thus price bracket. Recommend the brand! Got a 65" TV nailed to the wall with a VonHous bracket. Excellent quality, easily up to the job. Never miss a 'TV Mount' deal again! Double sided tape should do it. You can get them cheaper on eBay. Plus these ones make your TV stick massively. Bracket arrived today . Model wm6411 which ranges up to 60". Comparable price at Amazon is £39.81 at the moment. All looks good, just need an hour or so in order to fit it rather than spending time on here spending (or saving) money :D .
Thanks I look to close this then. Hopefully for those who have purchased it will be a breeze to install. Lighting Deal on Amazon therefore be quick! Cheaper today than the offer at Domu yesterday. Not this one it wasn't - £14.99 it was, deal posted here also. Can't be bothered faffing around for the two quid though lol, it just arrived today. I've got these and works well. Bit stiff and can carry TV weight up to 45kg I think. Using it with a bigger TV than 56" and seems solid enough. As far as I can see there are no reviews on Amazon for the product you linked. Maybe you saw them elsewhere, but I'd also take reviews for unknown brands with a pinch of salt, as it's well documented that a lot can be fake. I'm just saying, if you have a decent TV it might be worth spending a bit more as there are good mounts around £20, which not only are safer, but will give you extra features. It’s safe look at the reviews left.the price is the bargain.i have a £3 spiegen case on my iPhone X does that worry me no it doesn’t. 1.5k TV on a £7.69 frame? I hope you have great insurance coverage. is it best to get a tilting one? Cool. Think I’ll invest also as it looks like the bracket is quite sturdy and spreads the weight well on a plastered wall? SomPun ts £12.74 on amazon lightning deal right now do you have link ? Looks like a great deal - Ultra Slim 34mm from the wall, -15+15 Tilt, with a Super Strong 75kg Load Capacity and built-in Spirit Level. Are 65 inch tvs top big to utilise the tilt function? Is general practise to use a fixed wall bracket so the TV is as close to the wall as possible? Thanks op, just ordered! Not sure if these are any good hopefully it does the job! 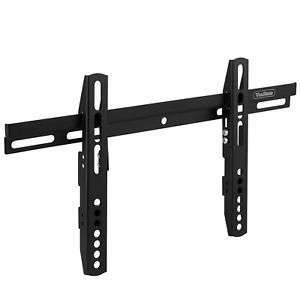 VonHaus 37-70" Fixed TV Wall Mount Bracket £11.99 Del @ Amazon - Dispatched from and sold by DOMU UK. 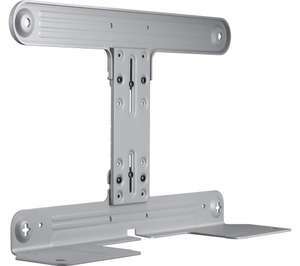 With a 65 inch TV, would it be better to get one of these so it's fixed to the wall or get one of the rotating ones? Thanks I tried it again and it’s works but the website is so slow. It’s not adding to basket!!! Temptation removed! I would have bought this if it were not for the various worries I had about motion issues. I don't really want to compromise when I am dropping £2k on a TV! Holding out for either the updated version of this panny or an LG in black friday sales. Finally some sense from a fellow poster here. Everyone jumps on the defensive when the LG OLED's processing gets mentioned. I had a 77 inch C8. Motion interpolation artifacts were obvious and constant. Higher frame delay than competitors and HDR brightness was rubbish. Oh and like you say when it couldn't work out the motion correctly... Stutter.